Athletes have long been known for their superstitions. Amongst the elite, it is probably hockey players that hold on to them most dearly. From the way they get dressed, to what they tape on their sticks, these athletes have long conformed to ritual. Change one iota of said routine and the play on the ice is undoubtedly doomed to suffer. Current Colorado Avalanche head coach and Hall of Fame goaltender Patrick Roy was one such player. On his sticks, you would find the names of his children. On the ice, he refused to step on the red line or the blue lines. He would even talk to the posts, envisioning them getting smaller. Roy, like many others, thought such activities brought him good fortune. But what about the other side of the supposedly lucky coin? Do curses also exist in hockey? In Colorado at least, they just might. 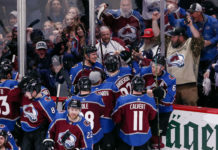 There are murmurs, nay, whispers in the Mile High City that if you want to have a long, prosperous career with the Colorado Avalanche, you should avoid the number 18. Perhaps it’s an old hockey wives’ tale. Perhaps it’s something more. Let’s take a look at the evidence. Many people have donned the number for the Avalanche, the first of which being Adam Deadmarsh during the team’s inaugural season. Though nothing terrible happened to him on the ice during his tenure with Colorado, it is worth mentioning that he had his name spelled wrong on the Stanley Cup, after they captured it in 1996. All was made right, as he became the first player in NHL history to have such a mistake fixed. A happy ending, not a bad start. After that, things started to get weird. 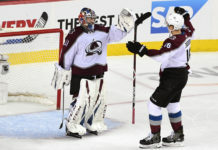 Three prominent players for the Avalanche would start their time with the team with different numbers, only to switch to 18. Chris Drury was originally number 37. Alex Tanguay was originally number 40. Stephane Yelle originally donned number 26. This trio had success with their original number. All three were part of the team’s Stanley Cup championship team in 2001 (Yelle also won in 1996). One by one, they would switch to 18. One by one, their time with the Avalanche would come to an end. Drury would switch to 18 prior to his final season in Colorado. After the 2001-2002 campaign, he would find himself in an ugly contract stalemate with the Avalanche. Ultimately, he would be dealt to the Calgary Flames (with Yelle, no less) just prior to the start of the following season. The end of Tanguay’s first tenure with the team would come in similar fashion to Drury’s. He would switch numbers in 2004. After two seasons wearing 18, he too would find himself in a contract stalemate, and would be dealt to the Flames. Yelle had a different story. During his first tenure with the Avalanche, he wore only 26. He was known as an elite defensive center during that time. 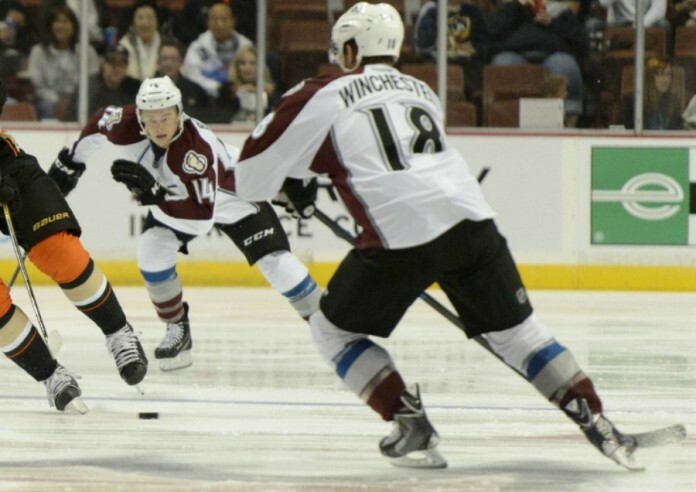 In 2010, the Avs reacquired Yelle and, with 26 taken, he too donned the number 18. Acquired to bolster the roster for the playoff push, the stint would be an utter disappointment. In 11 regular season games and six playoff contests, he would fail to find the back of the net, mustering only a single assist. The Avalanche would fall to the San Jose Sharks in the first round. Yelle would retire after the season. In recent years, players have not fared much better. Brandon Yip would switch from 59 to 18 in 2010. 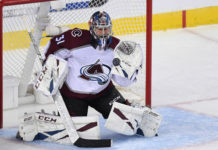 While the first year in the number went well, he would go scoreless in the first 10 games of the following season, and would be waived by the franchise, never to don a burgundy and blue sweater again. The most recent example is poor Jesse Winchester, who would select 18 upon his arrival in Colorado during the summer of 2014. He would suffer a concussion during the preseason. A concussion he has yet to recover from. Maybe all of these examples are purely coincidence. Maybe though, the reasoning behind the misfortune is much more sinister. After all, if broken down, the numerals of the “number of the beast” (666) do add up to 18. That’s not all, either; 12th century teacher Theobald of Langres, who was infamous for his work in the field of numerical symbolism, said the number 18 symbolizes those who do not want to receive the name of Jesus, or those who did receive it, but did not persevere. Religious or not, this cannot be a good omen. Perhaps Adam Deadmarsh cursed the number when he was traded to the Los Angeles Kings in 2001 (where he instead opted for number 28). Perhaps that is why Tanguay returned to his original number of 40 for his second stint in Colorado. Perhaps that is why Winchester was so quick to surrender it to recently-acquired forward Shawn Matthias (who wore 23 with the Toronto Maple Leafs, but that number belongs in the Pepsi Center rafters , not on the back of Matthias). Hopefully Matthias is not a superstitious man. Even better, hopefully he can break the curse. Either way, his time with the Avalanche is certainly off to an inauspicious start, perhaps even doomed before he even steps foot on the ice.